I know that McCain and Giuliani are using this rhetoric to prove their toughness and to show that they regard Osama and Saddam as evil. But, as a Christian and a pastor, it makes me feel uncomfortable. From that perspective, it's appropriate for us to make judgments about people's actions, but not their eternal destinies. This is precisely the kind of judging Jesus was excluding when He said, "“Do not judge, so that you may not be judged" (Matthew 7:1). As to the existence or non-existence of hell, it may be consoling for us to say that it doesn't exist. But some who adgere to this position have reason to second-guess themselves. I refer to that segment of the population surfaced repeatedly by public opinion polls: those who indicate that they regard the Bible as the Word of God, accept the deity of Christ, and believe that there is a heaven, but also dismiss the idea that hell is real. Yet Christ, the central figure of the portion of the Bible accepted as part of the Bible by Christians, insists that both are real. To the extent that the two candidates are using hell to make political points, they trivialize both hell and their points. This is especially true if, like some Althouse commenters, they don't believe that hell exists. Back in the 1948 presidential campaign, someone at a Harry Truman whistlestop tour encouraged the embattled chief executive with the words, "Give 'em hell, Harry!" as he excoriated the do-nothing 80th. Congress. Though the supporter's words became his nickname, Truman insisted that he wasn't giving the Congress hell, just telling the truth, and it felt like he was giving them something else. McCain and Giuliani obviously feel that their hell-rhetoric proves to Republican primary voters that they will be tough on national security, the same reason that Mitt Romney made a big point of how he wanted to see bin Laden killed during the debate on Thursday night. Schirra was one of my boyhood heroes, an astronaut in the Mercury, Gemini, and Apollo programs. In a career that included combat missions in Korea, test piloting, and being among the first Americans in space, he demonstrated daring, intelligence, and a joker's wit. His later work alongside CBS anchor Walter Cronkite in covering the US space program made the experience of America's space pioneers accessible. In 1981, he was quoted as saying about space: "Mostly it's lousy out there. It's a hostile environment, and it's trying to kill you. The outside temperature goes from a minus 450 degrees to a plus 300 degrees. You sit in a flying Thermos bottle." In an interview with the Associated Press last month for Earth Day, he said that when looking at the globe from orbit, he was struck by its fragility and its lack of borders. "I left Earth three times, and found no other place to go," he said. "Please take care of Spaceship Earth." I never want to engage in hero worship, though I always will have heroes. Wally Schirra was a hero. What Do Paul McCartney and My Son Have in Common? My first impression of tonight's debate from the Reagan Library was what a contrast to last week's Democratic debate. The two parties, in many ways, occupy different thought worlds. That may best be seen in the marginal candidates in the two different parties, Kucinich and Gravel representing the kookie fringe of their party and Paul and Tancredo in theirs. The parties remain essentially left and right, respectively. The John Edwards of tonight's debate was Mitt Romney. Like Edwards, many of Romney's answers seemed overly-calculated, focus-group vetted, and too clever by half. The Joe Biden was Mike Huckabee, who managed to show some wit and probably beat people's expectations coming into the evening. The debate also showed that there is a real fight over the definition of conservative. That's the clear result of the Bush Administration decision, rightly or wrongly, to depart from the traditional conservative principles by initiating war with Iraq. I was struck by virtually the entire field's willingness to disagree with some aspects of the current administration's policies. That no doubt has something to do with the President's current low-approval ratings. But I also think that these candidates were signaling their comfort with being their own persons. The only one unwilling to distance himself from George Bush was Mitt Romney. Iraq was the 800-pound gorilla and there were some nuanced views expressed on the topic. Thompson trotted out his interesting idea of asking the Iraqi people whether the US military should remain in their country. Brownback seemed to endorse the Joe Biden partition-share-the-oil-revenue-within-a-federation approach to Iraq. Huckabee and Brownback particularly emphasized the need to engage in diplomacy in Iraq. The only candidate to administer what could be a fatal blow to his slim chances of gaining the nomination--apart from Duncan Hunter, Ron Paul, and Tom Tancredo, who have no chance of winning anyway--was Tommy Thompson, when he said that employers should be free to discriminate against homosexuals. Rudy Giuliani was almost invisible and probably hurt among conservatives when some of his more liberal views were aired. John McCain spoke directly into the camera with greater consistency than any of the other candidates. For a candidate who, until recently, has been perceived as being in drift, McCain was forceful and focused. In my last letter, I mentioned that among the reasons people don't get connected to a church is their confusion over two words: sin and justification. The first word is misunderstood, sometimes by Christians themselves, who often use it as Gatling Gun to pound others into spiritual submission. I tried to present a Biblical understanding of sin in my last letter. Justification is a common enough word in everyday speech. That's both a plus and a minus for people trying to understand the Christian faith. It's a plus because the word as used in the Bible is similar enough to common usage that even people who've never read the Bible have some sense of what it means when Christians use it. "Joe gave his extreme fatigue as justification for his unkind words," we might say. In other words, Joe claims his exhaustion as an excuse for being unkind. But Biblical justification deals with the fact that sin, all sin, is a violation of God's will and that the rightful punishment for our sin is serious. Very serious. "The wages of sin is death," the first century preacher Paul writes in the New Testament book of Romans. Murdering someone--and Jesus makes clear that murder includes making another person feel small with unkind names--is punishable by death. Telling lies or half-truths about others' actions is punishable by death. So is stealing from someone else, committing adultery, coveting what others have, or failing to use God's Name for anything but prayer, praise, or thanksgiving. When we renounce our sin and let Jesus Christ be the Lord of our lives, we are justified. As a homely old saying puts it, "I enter God's kingdom 'just' as 'if I'd' never sinned." Through Christ, we are reconciled with God and the power of sin over our lives--including separation from God--is canceled. Labels: justification, why should I go to church? ...women with college degrees tend to go into fields like education, psychology and the humanities, which typically pay less than the sectors preferred by men, such as engineering, math and business. They are also more likely than men to work for nonprofit groups and local governments, which do not offer salaries that Alex Rodriguez would envy. As they get older, many women elect to work less so they can spend time with their children. A decade after graduation, 39 percent of women are out of the work force or working part time -- compared with only 3 percent of men. When these mothers return to full-time jobs, they naturally earn less than they would have if they had never left. Do we value those in helping or nurturing professions less because they're mostly filled by women? If that's the case, we're once more dealing with the ugliness of sexism and a gender-based pay gap. And how much lost income should a woman--or a man--endure for taking time off to be there for their kids? Granted, during the time of their absence from the fulltime workforce, stay-at-home parents are losing out on experience and exposure to new ways of doing things in their fields. But, they also are gaining experience in interpersonal skills and the management of time and other resources. Many employers find that women who have taken time away to be with their kids become great managers, better managers maybe than they would have been had they not taken time away from full-time employment. How much of the twenty-three cent pay gap between genders would be erased if employers recognized the value of the stay-at-home experience in the paying work environment? I'm not sure the discrimination thesis really has been "debunked." Instead, I think that the discrimination behind the pay gap is more multilayered and more complex than it's usually portrayed as being. What do you think? Could you use a good laugh? The laughs will be in ample supply on Saturday, May 19, starting at 7:00PM, when comedian Marty Daniels brings his wacky worldview to Friendship Lutheran Church, 1300 White Oak Road, near Amelia. Daniels is currently involved in a major tour, taking him to huge venues in the Midwest and South. Marty Daniels has been called lethal, outrageous, and quick-witted, among other things. He generates laughs based on humorous observations of the absurdities of life, even those of the church. He also happens to be hilarious! Daniels spent 15 years working as a popular radio personality in mainstream and Christian radio. Always a visionary, he helped build one of the nation’s top radio stations from the ground up in his hometown of Columbus, Ohio. Over the past 20 years, Marty has helped plant churches, worked in comedy clubs and on college campuses, and been instrumental in the start-up of several business ventures. His squeaky clean comedy has inspired laughs for everyone from the sick, the homeless, the elderly, and grief stricken to top figures in industry, politics and entertainment. His corporate shows earn rave reviews. An interesting element of the May 19 performance is that Daniels' first comedy CD will be recorded then. Daniels also happens to be the brother of Friendship’s pastor, Mark Daniels. You won’t need a ticket for this evening of fun. A freewill offering will be received. EVERYBODY IS INVITED! For more information, contact the Friendship Lutheran Church office at 513-752-5265. 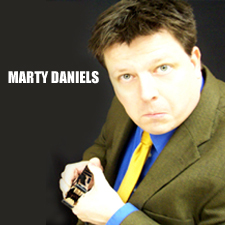 To find out more about Marty Daniels' comedy, go here and here. My weekly sermons appear on two different web sites and sometimes, readers send me their comments. One commenter liked a recent sermon in which I said that the Bible’s definition of a saint is anyone who turns from sin and believes in Jesus Christ. One thing this commenter wrote disturbed me. She wrote: "I'm also a priest - Though I believe women should keep silent in the 'church.'" She cited 1 Corinthians 14:35, where the first century preacher Paul writes, "it is shameful for a woman to speak in church," as the reason for her position. I don't agree with this interpretation of the passage. To me, it ignores the context in which Paul was writing. Chapters 13 to 15 of Paul's first letter to the church in the Greek city of Corinth deal with what's called, "the gift of tongues." This is a rare gift God gives to some Christians, mostly to help them praise God in a way that brings them personal comfort. At Corinth, there were Christians insisting that their possession of this gift made them spiritually superior. They often disrupted worship, many different people speaking in tongues at once. Without someone to interpret the meaning of these strange utterances, these people were making other members of the Corinthian church feel excluded and causing visitors to worship to think that Christians were kooks. Paul told the Corinthian Christians that, at most, only three people should speak in a tongue and that even they shouldn't do it unless there was someone else able to interpret them so that everybody could benefit. Otherwise, Paul said, people should keep their mouths shut. "For God is a God not of disorder but of peace," he says. Within the context of discussing disorder in worship, Paul then says that women shouldn't speak in worship. What's up with that? The Corinthians and other first-century Christians apparently configured their worship in the way Jews historically had in their synagogues, men forming an inner circle or semi-circle in an area closer to the rabbi and readers and explicators, women and children consigned to somewhere behind a grated or meshed divider. Some women at the Corinthian church, unable to hear all that was being said, were calling out to their husbands, asking them to repeat things. To Paul, this was another disruption of worship. But does any of this mean that women shouldn’t be preachers, worship leaders, readers, minstry leaders, musicians, or worship participants? I don’t think so at all! Jesus, of course, bowed to the conventions of first century Judea when He only called men to function as apostles, leaders of the early Church. He did this, I believe, knowing that in that time and place, only men would be accepted in the role of leaders. But unlike other first-century Judeans, Jesus spoke to women with the same consideration and respect He afforded men. Even a casual reading of the Gospels in the New Testament will bear this out. And it always tickles me that Jesus chose women to be the first to proclaim the Good News of His resurrection (Matthew 28:1-10). No wonder then, that the same Paul who wrote 1 Corinthians 14:35 also wrote: "There is no longer Jew or Greek, there is no longer slave or free, there is no longer male and female; for all of you are one in Christ Jesus" (Galatians 3:28). In 1 Corinthians 14, Paul makes clear that speaking up in worship is no right. It's a call. But I believe that the God Who calls people to play their parts in the ministries of the Church calls women just as He calls men. I post my weekend messages both here and over on ShoutLife, a sort of Christian MySpace. One of my regular readers liked my message, Saints Alive. One of the things I affirm there is the Biblical view that saints are repentant sinners who believe in Jesus Christ. Every believer in Christ is a saint. The commenter, a newspaper columnist whose writing I really enjoy, liked what I'd said. But in her comments, she wrote something that disturbed me: "I'm also a priest - Though I believe women should keep silent in the 'church.'" She goes on to cite 1 Corinthians 14:35, where Paul writes, "it is shameful for a woman to speak in church," as the reason for her position. I don't agree with her interpretation of that passage. I feel that it ignores the context in which Paul was writing. Chapters 13 to 15 of Paul's first letter to the church in the Greek city of Corinth deal with what's called, "the gift of tongues." For the uninitiated, this is a rare gift God gives to some Christians, mostly to help them worship and praise God in a way that brings them personal comfort. At Corinth, there were Christians insisting that their possession of this gift made them spiritually superior. They also were disrupting worship, many different people speaking in tongues at once. Without someone to interpret the meaning of these strange utterances, these verbal eruptions were making some members of the Corinthian church feel excluded and visitors thinking that Christianity was nutty. Paul told the Corinthians that while he himself had this gift, they should have at most only three people speak in a tongue and that even they shouldn't do it unless there was someone else able to interpret it so that everybody could benefit. Otherwise, Paul said, people should keep their mouths shut. "For God is a God not of disorder but of peace," he writes. The Corinthians and other first-century Christians apparently configured their worship in the way Jews historically had in their synagogues, men formed an inner circle or semi-circle in an area closer to the rabbi and readers and explicators, while women and children were consigned to a grated or meshed divider. Some women at the Corinthian church, unable to hear all that was being said, were calling out to their husbands, asking them to repeat things. To Paul, this would have been another disruption of worship, which should always be orderly and, for the sake of those who don't yet follow Christ, understandable, accessible. Paul never engaged in frontal assaults on societal conventions. He had bigger fish to fry. He seemed to believe that if people came to know and follow Jesus Christ, it would change how they lived in society. The whole point of the "household codes" with which he and Peter end some of their New Testament writings wasn't to endorse things like slavery or patriarchy, but to encourage those living under such systems--masters, slaves, husbands, wives, parents, children--to live in such a Christian fashion that those with whom they rubbed shoulders on a daily basis would be attracted to Christ. Whether as preachers, worship leaders, readers, minstry leaders, musicians, or worship participants, I believe that women who have been called to do so should speak up in worship. Jesus too, bowed to the conventions of first century Judea when He only called men to function as apostles, as leaders of the Church, knowing that in that time and place, only men would be accepted in the role of leaders. But unlike other first-century Judeans, Jesus spoke to women with the same consideration and respect He afforded men. He refused to sanction the stoning of a woman caught in adultery. He upbraided His apostles when they condemned a woman extravgantly anointing His feet with expensive perfume. He playfully dialogued with the foreign woman who asked for His help, extolling her faith to others. He chose a sinful woman from Samaria to proclaim Him as the Messiah to the villagers at Sychar. He chose women to be the first to proclaim the Good News of His resurrection. Early in church history, the Spirit designated a husband and a wife team to tutor the prominent evangelist Apollos. And who can forget Lydia, the dealer in purple, the wealthy businesswoman, who had so much to do with the spread of Christianity? Or Dorcas, whose life of servanthood inspired and moved others in their discipleship? No wonder then, that Paul wrote: "There is no longer Jew or Greek, there is no longer slave or free, there is no longer male and female; for all of you are one in Christ Jesus" (Galatians 3:28). We are safer today, more protected from pain and death, than previous generations of Americans. You wouldn't know it from the headlines or the paranoia that seems to have infected the country. Dr. Sydney Spiesel reminds us of how safe we are, even while advising parents on how to help their children with their fears. Be careful. But don't be paranoid. Be realistic and remember to depend on the God we meet in Jesus Christ, no matter what. The other day, I read an article about Biosphere 2, the three-acre facility built in the desert near Tucson almost twenty years ago. It featured a self-contained ecosytem, including an ocean, meant to replicate that of what its builders called Biosphere 1, our planet earth. For two years, eight people, called biospherians, lived and worked in the enclosed environment. It wasn’t an altogether happy experience. Part of the reason is that they spent the first thirteen months as subsistence farmers who lost weight an alarming rate and as repairpeople staving off destruction of their environment by some of the insects in residence with them. What’s most amazing, maybe, is that eventually these eight people, all originally motivated by high ideals, broke into two groups of four people each. Though it’s been thirteen years since the group emerged from their biosphere, in the words of writer Reed Karaim, “exiting like newborns...hypersensitive to smells and tastes, overcome by the plentitude in a supermarket,” they still apparently are divided into two opposing camps. The experience in Biosphere 2 did more than replicate the physical ecology of Planet Earth. The conflicts and nastiness that the biospherians exhibited toward one another also represents the sin in which we’re born and the sin in which we too often wallow. In spite of God’s call that we love Him and each other and even though we know that life and the world are better when we get along with one another, sin continues to tear us apart. Sin destroys our relationships with one another. Sin prevents us from accepting ourselves or becoming what we can be. Paul, writing in the New Testament book of Romans, says that all of creation--including us and our aging bodies--groans under the weight of our sin. But our Bible lesson for today gives us a different vision, God’s vision, of how human beings are meant, and one day will, live. It comes from Revelation. In it, John, writing in about 90AD, reveals a vision of heaven he was given during his imprisonment on the Aegean island of Patmos, just off the coast of modern-day Turkey. John found himself transported into the very throne room of God. But for Christians, this vision is supposed to be more than just sweet-by-and-by stuff, more than a promise. It also shows us how you and I, as followers of Jesus, the Lamb of God, are meant to live today. Christians are meant to be ambassadors for Christ and citizens of heaven even today. So how can we be Christ’s saints alive today? Our lesson, I think, shows us that this is to be done in at least three ways. First: We see ourselves as part of Christ’s eternal family, a family that can’t be numbered. In other words, we understand that we're part of God's family now and that there's always room for one more! This past week, a Roman Catholic writing in the online magazine Slate, noted that some members of Catholic Church object to the move to name the late Pope John Paul II a saint. They do so because they think that John Paul was wrong in many things he did as pope. But, the author argued, these people don’t understand that being a saint doesn’t mean that everything they did, thought, or said was perfect. I agree. Saints aren’t perfect. (That's why I wrote a response to the Slate article called Saint Misbehavin'.) But as one who tries to read my Bible closely, I also believe that saints are forgiven sinners. They’ve been made clean, our lesson says, by the blood of the Savior Who sacrificed Himself for us. Admission into heave is free to all who believe in Jesus Christ. Being made saints by Christ should also make Christians anxious to tell others the Good News of Jesus, so that they too can be part of the great heavenly multitude that no one can count. In our gratitude, who are we telling about Jesus Christ? What spiritually disconnected person are we inviting to worship with us? Second: We see ourselves as a new people. The multitude in John’s vision were dressed in white. In John's time, as in ours, white represented purity. Christians are sinners purged of their sin by Christ. But in John's time, white also symbolized victory. Saints made clean by Jesus also have eternal victory over death! We're not only new. We're eternally new! The throng of believers observed by John were dressed in the white of purity and victory for one simple reason: Though they had gone through difficult times, sometimes even persecution or death for their faith in Christ, they persevered. We can persevere in following Jesus. We need to persevere in following Jesus. Where else can we go but to Him for life made new? When the Spirit lives in us, God begins to displace our inborn penchant to be concerned for ourselves all the time. And that's a liberating thing! It’s our focus on ourselves that lay at the root of all conflicts, whether they’re within us, inside of families, or among nations. Once Christ is in our lives, we begin to get free of our slavery to ourselves, our wants, our whims, our obsessions. William Carey was an English missionary who lived from 1761 to 1834. As he was dying, a friend talked to him for a long time about all of his achievements for Christ. Afterward, the friend offered a prayer. Then Carey said, “Duff, you have been speaking of William Carey. When I am gone say nothing about me--speak only about my Savior.” Those are the words of a new man, like the words and songs of the heavenly multitude John saw. They sang about Christ, not themselves. Third: Christians know that, in spite of our imperfect lives today, we already are part of God’s forever kingdom. Like John, we’ve gotten a glimpse of our eternal destiny. Like him, knowing where we’re headed because we’ve repudiated our sin and surrendered our lives to Jesus Christ, we know that future is with God forever. I’ve mentioned before the habit of my seminary professor, Walt Bouman. He was a fan of murder mysteries and had the strange habit of reading the last chapters first. That way, he said, he knew what to pay attention to throughout the book. He knew what was important and what wasn’t. Jesus’ resurrection is a forecast for all who believe in Him. Like Him, we will live beyond death. Life is a little less mysterious to us than it is to other people. All believers in Christ will one day join those multitudes in praising Jesus. But, we can start praising Him today, not just through worshiping Him along with our church family every week. But also through our serving. By loving our neighbors. By inviting God into every decision we make. By putting God first. By sharing our faith with others. of people who persevere through tough times here knowing that they belong to Christ forever. But let’s ask God to make that more than just a heavenly vision for us here at Friendship. Let’s ask Him to help us to live that vision today!